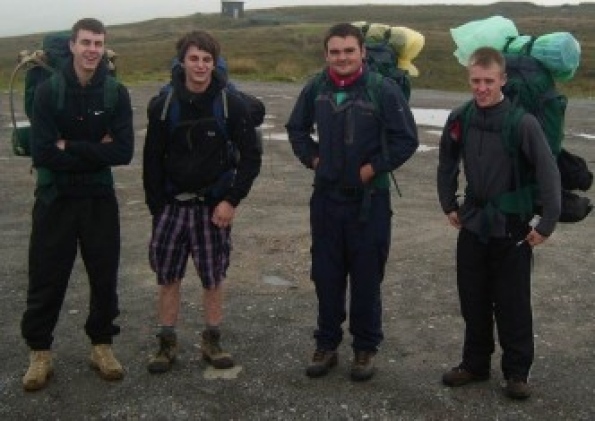 Hillsborough Explorer Scouts Kyle Johnson, Ben Perkins, Joe Bell and Tom Dyson have successfully completed their Queen’s Scout Award – equivalent to Duke of Edinburgh Award gold medals – following a four day expedition in the Yorkshire Dales. The dedicated quartet are the first Hillsborough Explorer Scouts to receive the award in eight years. Tom completed a four-day 50-mile hike and camping expedition on his 18th birthday. Joe said the success represented ‘the pinnacle of his scouting activity’. His efforts towards the award included being a member of the International Service Leadership Team at the World Scout Jamboree held in Sweden this year. Joe said: “I have been in the scouting movement since I was five, and to attend the Jamboree and to able to give something back, at the same time as fulfilling the residential element of the Queen’s Scout Award is really something special”. All four award winners are now helping in the cub and scout sections in the 150th (Wadsley Church) Scout Group as adult leaders – a further stage on their way to being full section leaders.